The fifth round of the 2017 Malaysian Superbike Championship concluded over the weekend at the Sepang International Circuit. 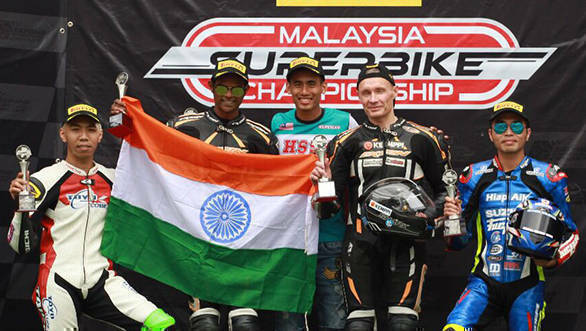 Team RACR Malaysia's Rajini Krishnan put up a stellar performance in both races over the weekend. Rajini finished Race 1 and Race 2 in second position on the 2014 Kawasaki Ninja ZX-10R. Hafiz Syahrin won both races aboard the 2017 spec Kawasaki Ninja ZX-10R. Syahrin has raced in Moto2 as well. Rajni Krishnan's performance was admirable since he was riding a much older machine compared to his rivals. Karhu Jouni Ensio finished third in Race 1 aboard his Kawasaki Ninja ZX-10R, while M. Farid Badrul Hisam stood on the third step of the podium at the end of Race 2. He was riding the BMW HP4. In the 250cc Class, India's Jagan Kumar finished the first race in ninth position, and second place in sixth position. It was a weekend to forget for Ritesh Sapre, the team's third rider, who ended both races out of the points.